Location: East side of the Lancaster Road bridge. Notes: Morecambe Poulton Lane was located on the London North Western Railway (LNWR) Morecambe branch which opened on 8 August 1864. 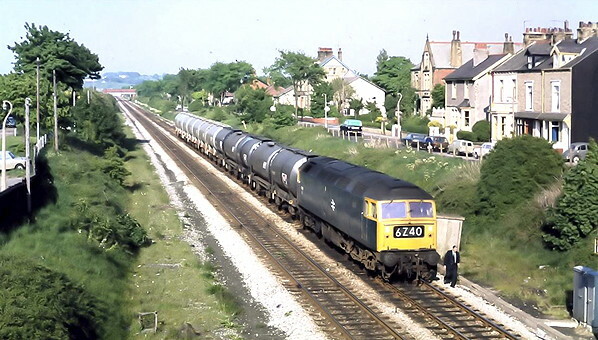 The Morecambe branch connected with the Lancaster and Carlisle main line at Hest Bank. The main line formed part of the Anglo-Scottish route between London and Glasgow (and later became known as the West Coast main line). 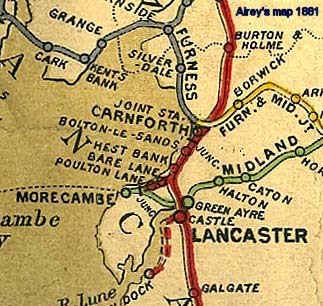 When the branch opened the LNWR used the Midland Railway’s (MR) Morecambe terminus, the MR line having opened in 1848. By the late 1860s Morecambe had developed as a seaside resort and was being visited by many thousands of people. The MR station became congested and the LNWR was asked to make its own arrangements for a station. The LNWR opened a station at Poulton Lane bridge on 1 November 1870. 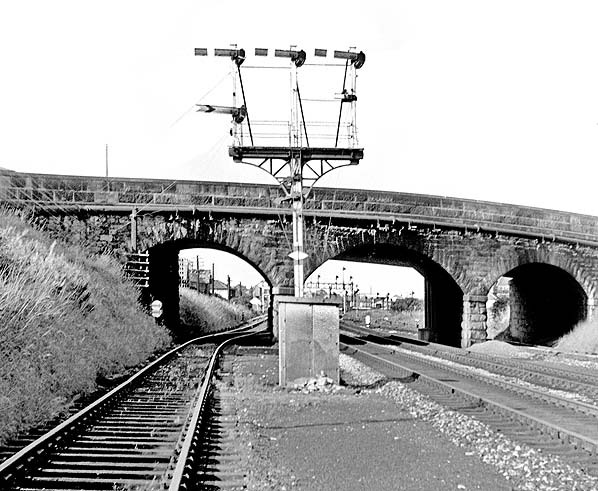 Although described as ‘Poulton Lane Bridge’ on nineteenth century maps it actually carried Lancaster Road over the line. There are no known photographs or maps showing Poulton Lane station, but it is likely to have been on the east side of the bridge and it probably had two platforms, the line being double-track. Morecambe Poulton Lane would have been served by local services to and from Hest Bank on the main line and by longer distance trains from various locations on the LNWR network. On 9 May 1886 the LNWR opened a new station a short distance to the west on Euston Road. Poulton Lane was closed and demolished shortly after. The line was still open in January 2014. The site of Morecambe Poulton Lane station looking west in September 1961. The bridge seen in the view was originally called Poulton Lane but from quite an early stage it carried Lancaster Road over the line. The signals indicate the routes to Morecambe Promenade (left), platforms 4 and 5 at Morecambe Euston Road station (centre) and platforms 1, 2 and 3 (right). The site of Morecambe Poulton Lane station shown on an 1891 map. The station was on the east side of the Lancaster Road. The bridge is titled 'Poulton Lane Bridge' on the map. Note that Bridge Road turns to the left running parallel with the line for a short distance. 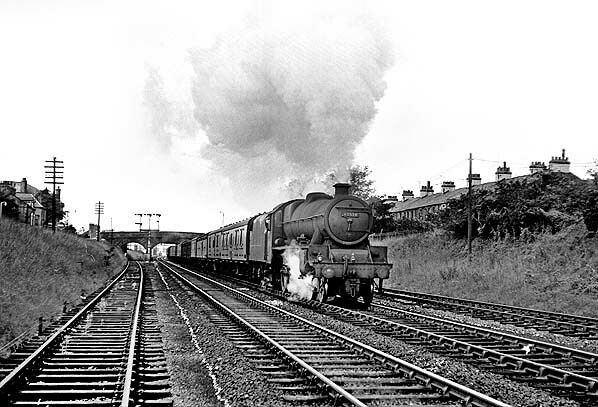 Looking west as 3J03 the Heysham Harbour to Manchester Victoria parcels service passes the site of Morecambe Poulton Lane station in September 1961. At the head of the train is locomotive number 45574 a Stanier designed Jubilee built at North British Loco works in 1934. It entered service on September 29 and lasted in service until March of 1966, when it was withdrawn from Leeds Holbeck (MR) shed and broken up in August of that year by Drapers of Hull. Looking east at the site of Morecambe Poulton Lane station on 27 May 1975. Tank train 6Z40 has been held at a signal waiting for a passenger train to depart from Morecambe Promenade station. The train was en route to Heysham and at its head was Class 47 locomotive number 47 190.